The fibrous structure, predominantly vertical, gives the plugs the desired resilience. One practical advantage when pricking out is that the plug retains its shape, makes good contact with the block and guarantees fast root growth. 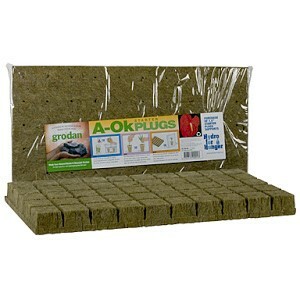 A good balance between small and large pores in the stone wool ensures an ideal air to water ratio in the plugs. The fibrous structure creates a balanced distribution of feedwater throughout the entire plug. In short, the homogeneity, flexibility, shape and firmness of Grodan plugs create the foundation for the optimum germination process and a uniform sowing result. The 1.5” size work perfectly in the Gro-Smart tray. The advantage of the Gro-Smart tray is it elevates the plugs above the waterline and ensures good airflow around the plugs. A-Ok plugs come labeled with instructions in a shrink-wrapped sheet that fits a standard 10 x 20 tray (flat). The 1.5” A-Ok fits holes in all our Gro-blocks perfectly.